We recently got a new grill and I've been using it every chance I get. 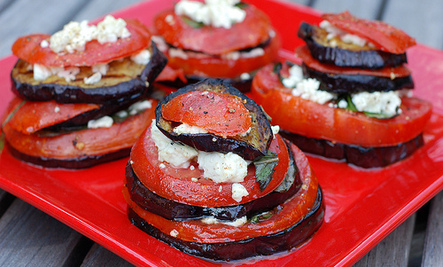 I made this recipe for Grilled Eggplant Stacks with Tomato, Feta & Basil the other night and it was outstanding. 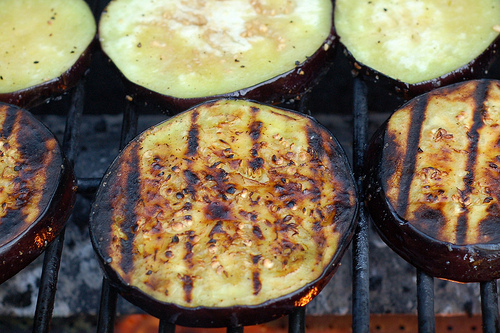 The grilled smokey flavor of the eggplant really made the dish. It was a healthy version of eggplant parmesan. Loved it! This recipe is originally from the August 2005 edition of Gourmet magazine and I found it on Care2.com, which is a great website. Check it out if you haven't had a chance.